﻿A church has stood on this site since the 7th century. The early church would have made from wood and thatched with reeds. 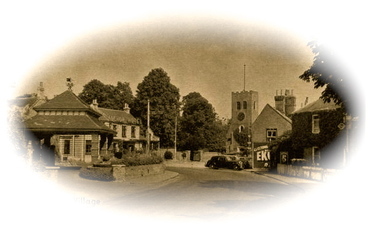 The monks from Chertsey Abbey may have originally ministered to the villagers, but the entry for Shepperton in the Doomsday Book does include a priest.In the 12th century a more solid structure of stone and flint was built. In 1605-6 high floods inundated the church. Some timber and stone were salvaged and incorporated into the present building which was completed in 1614. 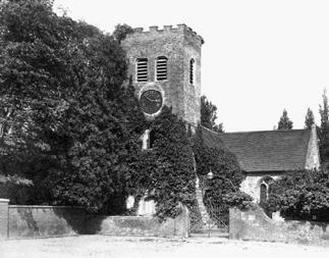 A hundred years later the Rev Lewis Atterbury, at the suggestion of Queen Anne, added the tower. This is built in Thames Valley brick, contrasting with the rest of the building, which is in a chequered design of stone blocks alternating with squares of flint rubble. The tower contains six bells, five of them dating from 1877 and the smallest bell named Little Nicholas was installed in 1980, when the tower was strengthened. The clock was placed in the tower in 1769. There is an external staircase leading to the gallery, added in 1834. There is another external staircase leading to the smaller Manor House Gallery over the baptistry. This enabled the Lord of the Manor to cut across the fields from the Manor House and enter his own pew without having to mix with the rest of the congregation. From this vantage point he could also keep a watchful eye on the Rector! The choir and clergy vestries on the south side were added in 1934. It is noticeable that the chancel and the nave are not quite in alignment - this could have been an error by the architect or maybe the builder. The pew are called "box pews" and date from the 19th century.On the gallery you will see a coat of arms painted directly on to the panelling. It is the Hanoverian Royal Arms, probably those of William IV. There are many reminders of past worshippers in the church, the stained glass windows, stone and brass tablets and war memorials. The chancel screen, reredos and choir and clergy stalls, along with the glass screens at the back of the church and the gallery, were all given by relations and friends in grateful memory of past parishioners. The organ is a Bishop organ installed in 1908. Originally a choirboy was paid one old penny to work the bellows for each service.